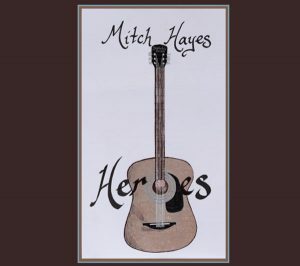 Okay loyal readers, let’s get this juicy tidbit on today’s review out of the way fast: Mitch Hayes’ HEROES is not a blues album – however it is one fine folk Americana album that is a beautiful result of one man’s dreams and ability to persevere through extreme circumstance. And let’s not forget that a number of brilliant artists like Bob Dylan, Neil Young, John Prine, and Steve Goodman to name a very few, have carved out amazing careers from a similar approach. Only time will tell if Hayes will stand with those giants, especially with him starting this aspect of his career later than most, but this album, his second, deserves more than to be buried under a slew of releases that are just rehashes of last month’s hits. HEROES is the genuine article – stripped down to the barest essentials of artist, words, voice, and instruments. Some may consider this a throwback, but it is much more than that, it is a brave and honest album. Hayes wrote all 12 of the songs on the album – every song is from his voice, his experience – and he has surrounded himself with family on it. 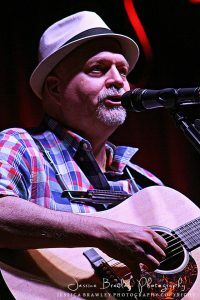 While Hayes handles the vocals, acoustic guitars, and banjo, his daughter Erin Hayes adds flute and background vocals, and son Jordan contributes background vocals. The family that plays together, right? He’s also joined by Eric Lovell on electric guitars, bass, dobro, mandolin, percussion, lap steel, and background vocals; John Spurrier on drums; Jason Atkins on piano, Rhodes, and organ; Austin Cline on cello; Rick Blackwell on electric and upright bass; Tony Prior on pedal steel guitar; H,L, Ruth IV on banjo; John Culbreath on fiddle; Mike Alicke on electric and acoustic guitars; and Gigi Dover on background vocals. Look At You starts off the album with an almost modern country feel before Hayes’ vocals take over. He has a raspy approach and his lyrics are strong. It’s a good soft opening to a surprising album. To me, this album just underlines how many talented people are out there – and they all deserve their opportunity to make the world a better place. Okay, I’ll step off my soapbox now. The Hardest Thing is a bittersweet song beautifully punctuated by the pedal steel guitar which gives it a sentimental longing. This is one of those hard memory songs that we all seem to have lodged in our past experiences. He follows up with All My Heroes, a song about the various people who inspired him to follow music’s path. Elvis, John Lennon, Jimi, Janis, all blazed that path lighting the way for the future. Erin Hayes’ flute adds a nice touch to the song. Next up is the up-tempo Hand Of The Devil, with banjo and fiddle – old school country or even bluegrass. I’ve always been attracted to songs that told stories and this is certainly one of those. It’s a good touch. The line “I’m an old man in a young man’s game,” is one that many of us have felt but never articulated. Excellent song and I can see this being covered by a number of artists. Hayes starts off All Fall Down with simple acoustic guitar and heartfelt lyrics that echo the sentiments of the turbulent ‘60’s. Why not, it’s an era he knows well and all of us who lived through that time were forever shaped by it. When we see now what we saw then, we must speak out. Home Again is another deceptively simple song. “Home” is one of those archetypical words that just springs so many memories and who better than a poet with a guitar to evoke those memories on our behalf? Some of those memories may be pretty awful, others good, but the lyrics play against the music for a surprisingly strong song. Helping Hand is a song that for some reason I hear in Pete Seeger’s voice. It’s a great folk song of people helping each other and has the opportunity for lots of sing-alongs from the audience. It’s a great song and a lot of fun. He segues into Ashes & Dust (Erin’s Song), a beautiful song inspired by his daughter. It’s obvious that she inspired him during his most trying time and he returned the favor by immortalizing his feelings in this song. I love the Celtic undertones that permeate the song. So much of Appalachian music is based on Celtic Reels and I am a huge fan of both. It’s probably time to discuss the change in Hayes while he was making this album. He finished his first album and was starting this one when he was diagnosed with throat cancer. He underwent treatment and is now (and hopefully always will be) cancer free. However, the treatment affected his voice and for a portion of HEROES he has a beautiful clear voice and other parts feature his gravel tinged voice after treatment. Both are effective as he sings from the heart – but there is a depth in the deeper gravelly voice that is sometimes absent in the earlier songs. In many respects, this album is a combination of Innocence and Experience if I may steal from William Blake. When you listen to this album, and I hope you will, see the subtle ways Hayes’ songwriting changes – or at least his approach to a song – and I think you will agree with me that he has a place among the best working today. Hayes takes on a reggae approach with A Peaceful Revolution and while it’s not overpowering it’s a nice feel. It’s a song celebrating revolution so it’s a perfect fit. I didn’t expect the reggae and it’s cool to hear him use the rhythms. A solo banjo opens Something Deep Within, and while not everyone enjoys the banjo, I do. My ears have pricked up and I love the old school country feel the song brings. I know the album is wrapping up and I’ve liked Hayes’ choice of instruments to give the album different emotions. There have been some very bold choices throughout the whole process. He closes the album with Home Again (Reprise), one last look. I’m usually not a big fan of reprises ending albums, but in this case, it’s a nice touch. Innocence and Experience. If you’ve stuck around this far, congratulations. Hopefully I’ve enticed you to seek out this lovely independent release and add it to your collection. He’s based out of North Carolina, (Charlotte I believe) a great area for all sorts of music. I don’t know if he travels much, but you can find out at http://mitchhayesmusic.com/ and buy his albums there as well. I know that I for one, am looking forward to hearing what comes next from this talented performer and hope he does find his way to hit the road and play some festivals. Otherwise, the Professor and Mrs. Professor are hitting the road to Charlotte and when we do, we’re visiting wherever he’s playing. If you get there first, tell him the Professor sent you!